The Mustangs are totally different than USC Upstate. They play a match-up zone, and don't shoot the three ball well. They struggled in their first game, losing to Texas St. 54-42. They led 23-16 at the half, and lost the 2nd half 38-19. They are led by Donovan Fields, a 5'10" 160# SR guard. He's averaging almost 20 points a game, and led them against Texas St. with 11 points. They won their opener against Menlo (NAIA), then played two PAC-12 teams, losing @Arizona 82-61 and @WSU 84-70 on Monday. They had a game with Sac. St. postponed (I am guessing air quality issues). Hope they overdo the mashed potatoes and gravy Thursday. UP has moved up 9 spots on the KenPom scale to #221, probably due to #135 North Texas remaining undefeated at 7-0, and #185 Hawaii upsetting Utah in Fullerton yesterday. The oddsmakers are generally installing the Pilots as 7.5 to 8 point favorites tonight over #323 Cal Poly, while KenPom is predicting, 74-65, Pilots. With JP no longer redshirting, the Pilots are now #330 out of 353 in terms of roster experience...the least experienced team in the WCC. That might work for schools like Duke and Kentucky, two teams that are even more inexperienced and have a number of "one and done" freshmen, but it's probably a disadvantage for the Pilots early in the season, and another good reason for not playing teams like UNC and Oklahoma. Cal Poly is #157 in terms of experience...Saturday's opponent, Texas St. is #51. It's one thing to do this against Cal State Northridge and Cal Poly. They better bring it a little earlier tomorrow against a good Texas State team! Impressive second halves by McSwiggan and Franklin Porter. 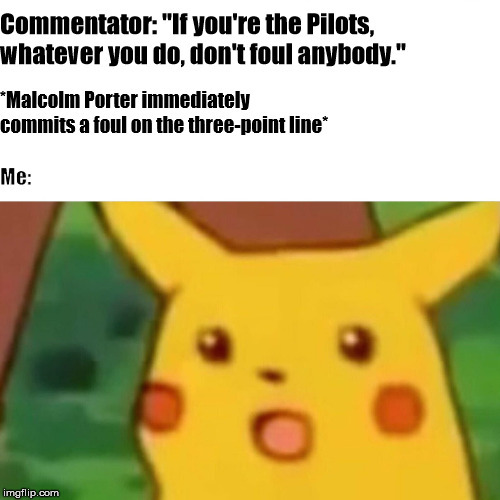 Let's hope we've seen the last failed late inbounds pass for a while! Looked like Hugh's injury was not as bad as I feared based on how it sounded. Perhaps it hurt especially badly because it was a re injury. If we're going to be a one half team I'll take the second half over the first half. I'd much prefer to play two halves like against USC though. Because of their awful shooting in the first half, the Pilots played a very short bench tonight. Basically 7 guys, with Taki also getting 3 minutes. Josh played 39 minutes, and did a lot of chasing on defense. By comparison, Texas St. played 12 guys, 11 with over 10 minutes, nobody over 30 minutes. Yeah, it didn't seem the Pilots were that confused by the quirky match-up zone...they just couldn't hit their shots, but it did help their shooting when they really pushed in transition in the second half, often not allowing Cal Poly to set up their defense. In some respects it was good to see UP can win without Marcus, who had one of his roughest nights as a Pilot, despites his 6 assists, but it was also nice to see Franklin finally perform as he was expected to do when he signed with SMC in 2015.